Published July 31, 2016 at 1171 × 659 in 16. Capital and Labor. •	Friedrich Graetz, “The Tournament of Today – A Set-To Between Labor and Monopoly.” August 1, 1883. 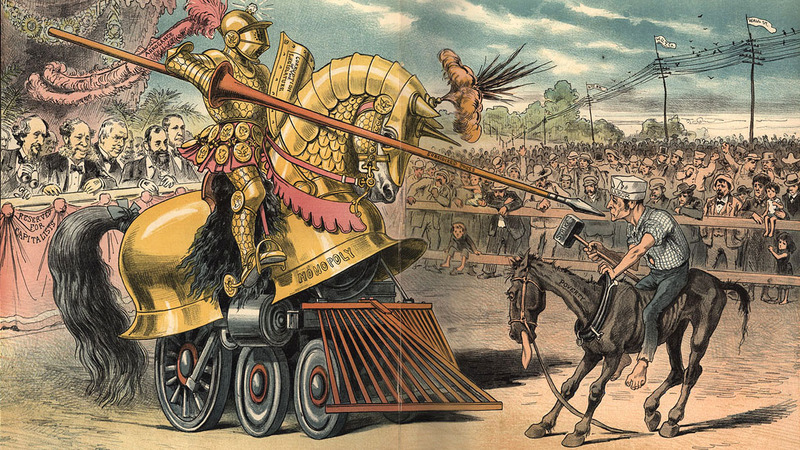 Print shows a jousting tournament between an oversized knight riding horse-shaped armor labeled “Monopoly” over a locomotive, with a long plume labeled “Arrogance”, and carrying a shield labeled “Corruption of the Legislature” and a lance labeled “Subsidized Press”, and a barefoot man labeled “Labor” riding an emaciated horse labeled “Poverty”, and carrying a sledgehammer labeled “Strike”. On the left is seating “Reserved for Capitalists” where Cyrus W. Field, William H. Vanderbilt, John Roach, Jay Gould, and Russell Sage are sitting. On the right, behind the labor section, are telegraph lines flying monopoly banners that are labeled “Wall St., W.U.T. Co., [and] N.Y.C. RR”. Via Library of Congress (LC-DIG-ppmsca-28412).